I picked up an earlier edition of this book in college but never finished. Recently, it's been updated and made cheap on Kindle, and as I've read numerous Monroe books since it became an auto-buy. How to review it, though? 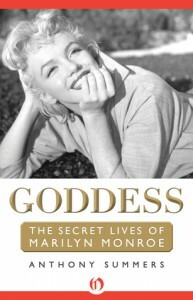 The author claims extensive and detailed research, but you find some of his sources are dubious in the eyes of die-hard Marilyn fans (the infamous Jeanne Carmen, for one). The speculation of Marilyn's final hours, with people in and out of her house while she purportedly lays dying seems the stuff of a Lifetime movie. In fact I recall a made for TV Marilyn movie that played out similar to some events portrayed here. I don't doubt some suspicious activity went down when Marilyn died, but Summers's book seems too much to believe. It is a conspiracy theorist's delight, but overall you'll probably read it with one eyebrow raised.